Two-time Idaho All-State girls’ basketball player Kaitana “KT” Martinez, 20, announced Friday on her Facebook page that she has retired from the Dartmouth College women’s basketball team after two seasons on the varsity at the Hanover, N.H. liberal arts college. Second-year head coach Koclanes had a 5-23 record at Dartmouth last winter after replacing 28-year Big Green coach Chris Wielgus, who had recruited 2012 Wood River High graduate Martinez. Wielgus won 12 Ivy League titles as Dartmouth’s head coach from 1976-2013. She moved on to become Director of Operations for women’s basketball at the University of Massachusetts in Amherst. In September, Wielgus was promoted to assistant women’s basketball coach at UMass. Koclanes had 18 on her roster last year, and this year’s 15-player roster prior to Friday’s cuts included 10 returning players and five freshman. 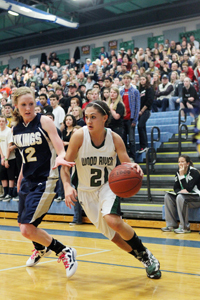 Wood River fans remember four-sport athlete Martinez as the floor general who led the Wolverine girls’ basketball team to back-to-back Great Basin Conference tournament championships in 2011 and 2012, and to State 4A runner-up and third-place tourney titles in those years. A 5-6 guard bouncing back from two knee surgeries, Martinez played in 47 Dartmouth games and started seven of them as a freshman and sophomore. She averaged 3.6 points per game and 2.2 rebounds as a freshman, and was seventh in the Ivy League for total assists. Her previous coach, Wielgus, said she brought out the best in her teammates. The daughter of Ron and Angie Martinez of Bellevue, Martinez is majoring in Neuroscience and Pre-Medicine with a minor in Religion. Her current courses at Dartmouth are Behavioral Neuroscience, Cognitive Neuroscience and Native American Studies: Indian Country Today. She said, “I plan to replace my time in the gym by becoming an undergraduate researcher with an MD or PhD at Dartmouth within the next few weeks. Haylee Thompson, a teammate of Martinez on the Wood River basketball teams that won two state tournament trophies, is on the 2014-15 roster for the Valparaiso University women’s basketball team. Thompson, 19, is a 6-1 forward for coach Tracey Dorow’s Crusaders. She sat out the 2013-14 season at Valparaiso because of NCAA transfer eligibility rules. At Utah State University as a freshman in 2013, Thompson played in 31 games, averaging 2.3 points and 2.4 rebounds per game.